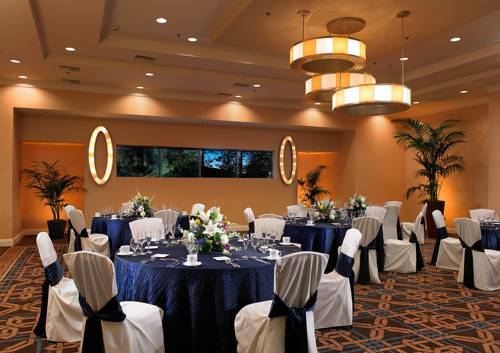 In the rolling foothills of the Santa Monica Mountains, the Sheraton Agoura Hills Hotel offers the services of a resort and exudes the soul of a boutique. Our picturesque location provides easy access to the area's major attractions, from corporations along the 101 Technology Corridor to Malibu's beaches and golf courses. Guest rooms and suites feature the plush Sheraton Signature Sleep Experience for a restful night, as well as a flat screen television, a mini refrigerator and other amenities to help you feel at home. And our well-appointed facilities, delectable dining and stellar service help to create an unforgettable retreat. More than 10,000 square feet of flexible meeting space comprises 11 meeting rooms, including an Executive Boardroom and the Grand Ballroom. Experienced event professionals and state-of-the-art audiovisual technology will help bring your ideal function to life. Share: For breakfast, lunch, or dinner, gather with friends or colleagues to enjoy the fabulous California-style cuisine and buffets prepared by Share.